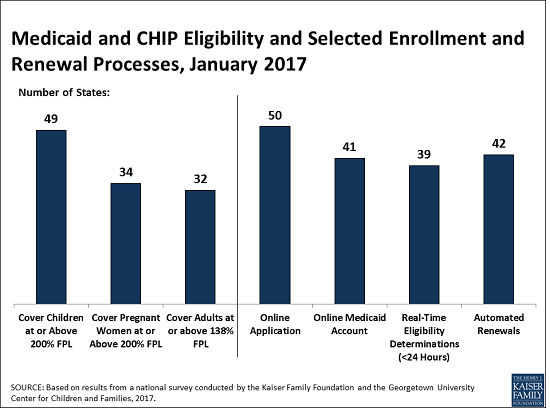 As the Trump administration and Republican leadership in Congress begin a new term and seek to repeal the Affordable Care Act (ACA), a new 50-state survey from the Kaiser Family Foundation offers an in-depth profile of Medicaid and Children’s Health Insurance Program (CHIP) eligibility, enrollment, renewal, and cost sharing policies in each state as of January 2017, providing a baseline against which future policy changes may be measured. Changes to Medicaid and CHIP could affect coverage for many of the nation’s low-income families and adults given the central role these programs play in providing coverage, as shown in the survey findings. As of 2017, 49 states cover children and 34 states cover pregnant women with incomes at or above two times the federal poverty level ($40,320 for a family of three). Thirty-two states cover low-income parents and other adults with incomes up to at least 138 percent of the federal poverty level ($27,820 for a family of three), reflecting their adoption of the ACA Medicaid expansion. In the 19 states that have not adopted the expansion, the median eligibility limit for parents remains at 44 percent of the federal poverty level and other adults without dependent children are not eligible regardless of income, except in Wisconsin. In addition to the impact on coverage, repeal of the ACA could alter Medicaid eligibility, enrollment, and renewal policies and processes in every state. The ACA standardized and streamlined these processes to move to a modernized, technology-driven approach. Following several years of state efforts to implement these processes through major upgrades to state eligibility systems, 50 states currently have an online application for Medicaid, 41 states offer an online account for enrollees to manage their Medicaid coverage, 39 states can determine Medicaid eligibility decisions within 24 hours, and 42 states are processing automated renewals. Since Medicaid systems coordinate or are integrated with Marketplace systems in all states, changes to the Marketplaces would also affect Medicaid. Lastly, the survey provides detail on states’ continued use of available options to expand access to coverage and further streamline enrollment and renewal processes and provides information on states’ use of premiums and cost sharing in Medicaid and CHIP. This 15th annual survey, Medicaid and CHIP Eligibility, Enrollment, Renewal, and Cost Sharing Policies as of January 2017: Findings from a 50-State Survey, conducted in the fall of 2016 with Georgetown University’s Center for Children and Families, offers an in-depth profile of eligibility, enrollment, renewal, and cost sharing policies in each state and can serve as a baseline for changes going forward. Reports from previous years can be found on KFF.org.